This month we see two new offerings from IK Multimedia. First up, they are now offering GrooveMaker, their remixing app, for android. Secondly, they have released a brand new version of their popular iRig guitar interface. GrooveMaker 2, and before that the original GrooveMaker, have been available on iPhone and iPad for quite some time. It has proven a popular app, with over 3 million downloads across its various versions on iOS. It is now available for smartphones and tablets running Android 4.1 and above for the first time. A free version is available to try, and it will retail at $9.99 for the full version. GrooveMaker 2 is a relatively simple app. You are provided with ‘packs’ of loops organised into ‘songs’. These cover various genres; techno, trance, electro, drum & bass etc. Each song contains over 60 loops, which you can then mix and remix in real time. Where things get slightly more interesting is with the fact that you can also import sounds and loops directly from your own music library. GrooveMaker 2 can also sync automatically with an external source using IK Multimedia’s X-Sync feature, which could potentially make this app an interesting live performance tool. 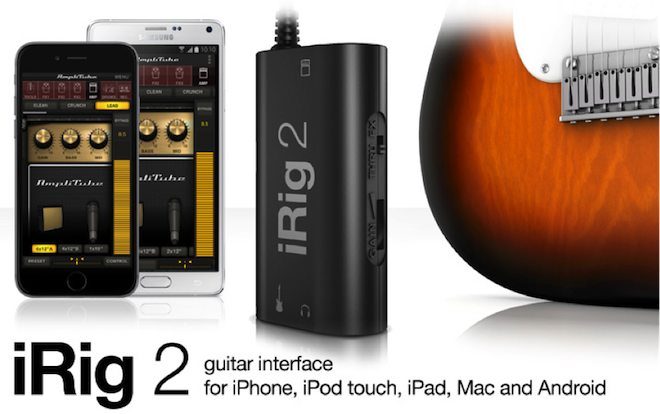 iRig 2 is the new version of the original iRig guitar interface and is compatible with iPhone, iPad and many Android devices. The idea is that you can use it to plug your guitar straight into your mobile device, enabling you to record good quality audio directly into an app – or practice your guitar using a range of different amp/effects pedal simulators. The iRig 2 comes complete with the basic version of their Ampitube app for iOS, Android and Mac/PC. This gives you access to a range of virtual amps and pedals on your device – although many more amps and effects are only available via in-app purchase. The headline feature of this new version of the iRig is a 1/4” amplifier output – only an 1/8” headphone out was included in the original version of the interface. This maybe makes the new version of the iRig more suited to practice and performance than its previous incarnation. The iRig 2 does not work with all Android devices so make sure you check compatibility before you buy. It has a 1/8” output connector that is compatible with any device with an 1/8” input that supports the CTIA/AHJ wiring standard. This does include many popular Android devices produced by manufacturers like Samsung, LG, Motorola, HTC and more. GrooveMaker 2 is available now for Android on the Google Play Store for $9.99/€8.99. A free version is also available. iRig 2 will be available soon and will be priced at $39.99.